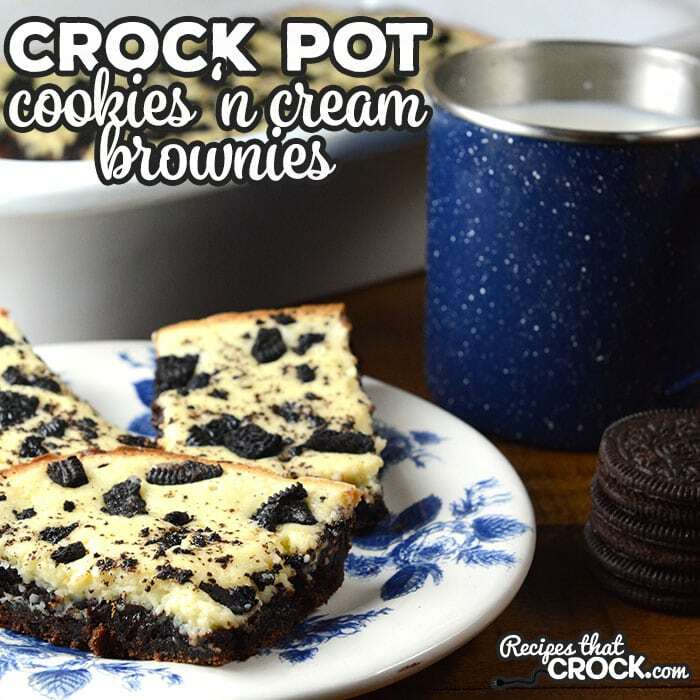 Crock Pot Cookies 'n Cream Brownies - Recipes That Crock! Do I have a sweet treat for you today folks! 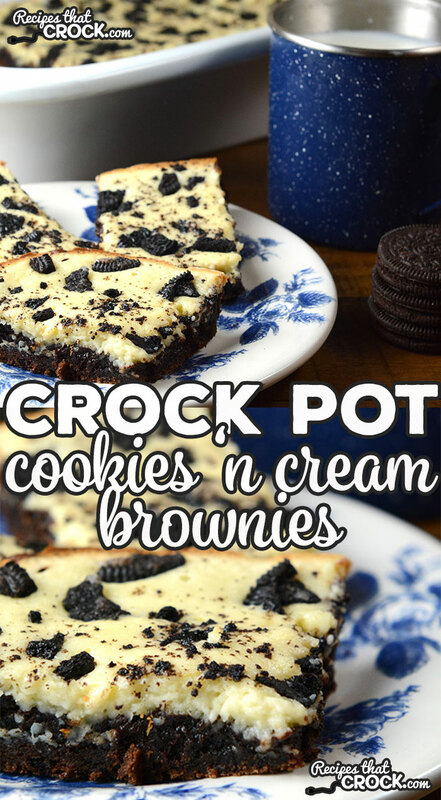 These Crock Pot Cookies ‘n Cream Brownies are so delicious! Everyone will want a second and the recipe! Aunt Lou here…aka the Sugar Princess. Any cookies ‘n cream fans out there? Love the candy bars. Love the ice cream. 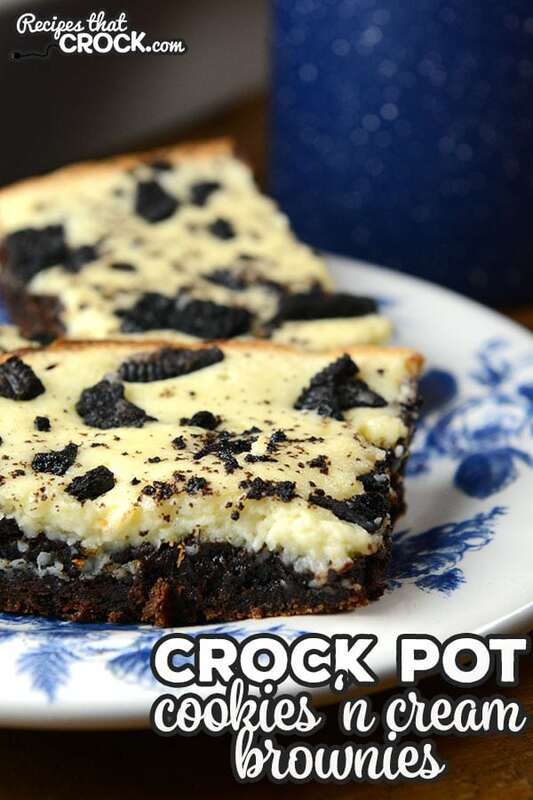 SO, when I saw the original recipe in Gooseberry Patch’s Best-Ever Cookies, Brownies & Bars, I knew I was going to convert it into this Crock Pot Cookies ‘n Cream Brownies recipe! This recipe is THE recipe to take to a cookout, potluck or party or to have as a sweet treat around the house! You’re gonna love it! Mix together your cocoa, butter, brown sugar and 1/2 cup sugar really well in a big bowl. Beat in two of your eggs, one at a time. In a different bowl, mix together your flour and baking powder. Stir your flour mixture into your cocoa mixture. Crush 12 of your cookies in a plastic bag. Stir in one teaspoon of vanilla and your crushed cookies. Spread your brownie batter into the bottom of your greased crock pot. Beat together your cream cheese, 1/4 cup of sugar, egg and vanilla until they are smooth. Pour over the top of your batter and spread out evenly. Crumble your remaining cookies on top. Put a few paper towels under your lid, cover and cook on high for 3-5 hours. Let them cool and cut into bars. You can use a 6-quart or casserole crock for this recipe. However, if you use a casserole crock, you run the risk of your paper towel touching the top of your brownies, which you don’t want. So either pull the paper towels tight under the lid or you might want to remove condensation from your lid periodically with a towel. You will want to make sure that you get the cream cheese mixture smooth. It took mine a while in my mixer to get it smooth, so be patient. Trust me, it is worth it! Mix together your cocoa, butter, brown sugar and 1/2 cup sugar really well in a big bowl. Beat in two of your eggs, one at a time. In a different bowl, mix together your flour and baking powder. Stir your flour mixture into your cocoa mixture. Crush 12 of your cookies in a plastic bag. Stir in one teaspoon of vanilla and your crushed cookies. Spread your brownie batter into the bottom of your greased 6-quart or casserole crock pot. Beat together your cream cheese, 1/4 cup of sugar, egg and vanilla until they are smooth. Pour over the top of your batter and spread out evenly. Crumble your remaining cookies on top. Put a few paper towels under your lid, cover and cook on high for 3-5 hours. Let them cool and cut into bars. You can use a 6-quart or casserole crock for this recipe. However, if you use a casserole crock, you run the risk of your paper towel touching the top of your brownies, which you don’t want. So you might want to remove condensation from your lid periodically with a towel.